It's no secret that Halloween is my favorite holiday, and I definitely enjoy getting in the "spirit" of things with my wardrobe. This October, I've already been a cowgirl; a Roy Lichtenstein-inspired pop art character; a zombie; and a sugar skull (look for the lowdown on the latter two in upcoming posts). I've still got a masquerade party on Friday and a Halloween chili cook-off on Saturday, so of course I've got two more spooky get-ups lined up before the witching hour tolls on October 31. I know, I know...that many costumes sounds like an expensive endeavor, but I am really big on creating costumes using elements that are already in my wardrobe. It's both more cost-effective and more fun. 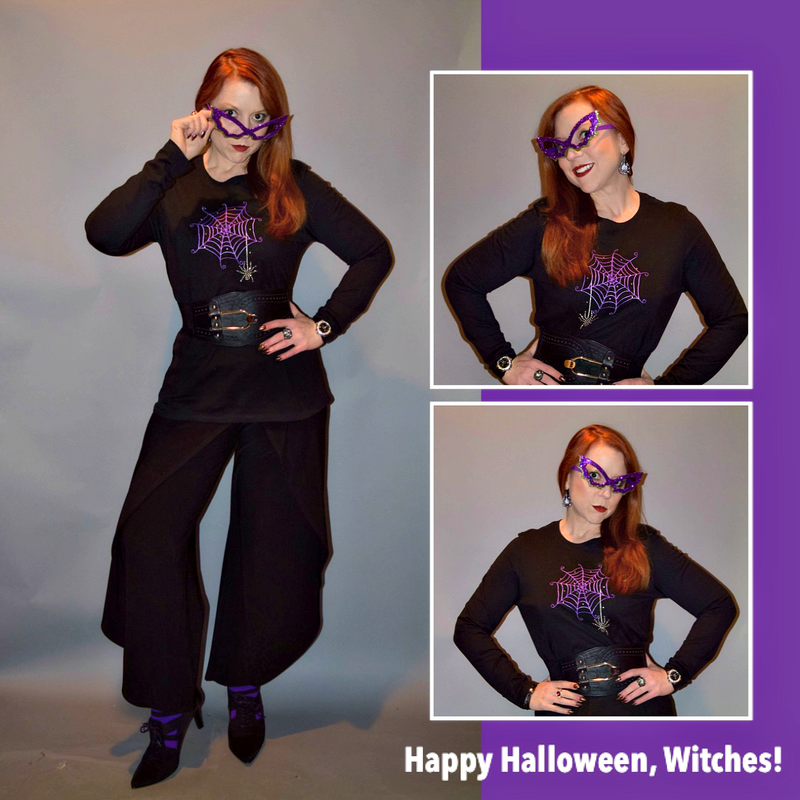 In the week leading up to All Hallow's Eve, I'm also apt to bring a (somewhat) subtle pop of purple or pumpkin to my everyday attire. But, there's a fine line between a touch of spooky spirit and looking like I'm channeling my second grade school teacher, who had a teddy bear sweatshirt for every season (Yuck - I prefer to keep my theme sweaters squarely in the "ironic, ugly-sweater party award winner" category, thank you very much). I found these black fabric Bandolinos on sale at Steinmart. 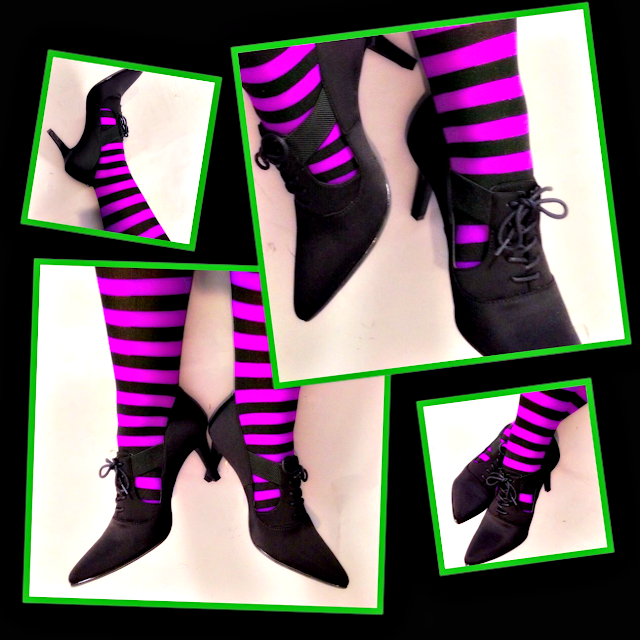 They're super comfortable and, although they're meant for everyday wear, they make excellent witch's shoes. I might pair an orange belt with a black jumpsuit, but you're not likely to see me sporting jack-o-lantern earrings at the office. And yet, when I pulled the purple and orange Halloween decoration storage totes from the attic this year (what...did you really think my storage totes weren't color coordinated? ), I found this spider web t-shirt tossed in amongst assorted witches capes, wigs, and costume accoutrements collected over the years (many of which are left-over "lost and found" items from Halloween parties past). I'm not sure how I got it. I don't remember buying it, and I don't have a clue how long it's been there. But, since some friendly ghost left it for me, I decided I might as well try to scare up a look that was Halloween chic on the cheap. After all, Fashion is what you buy (or find in your attic, as the case may be); Style is what you do with it!